I always thought when I got pregnant for the first time that I'd want a boy first. I always loved having an older brother. He was a great older brother, and anyone who knows my brother Colton could tell you why, he's just that. A great guy! Anyway I got pregnant and that immediately all went out the window lol I wanted a girl so much I could barely stand it. Here we are going on girl number 3 and I'm still grateful. I love having all these girls. I hope they love eachother and have as much fun as my mom, my sisters and I all have when we're together. Jayda has turned into not only a funny little character but she's such a good helper. I'm proud of her. I can only imagine when Leona shows up, how helpful she will be. Jayda get this, jayda can you get that???? lol my mom said the poor girl is going to call and say "Grandma I need a vacation!" I make it a point to tell her how much she helps me, and how much I love her, but it also makes me so sad that she's getting so big. The other day she was helping me make dinner and I just stopped dead in my tracks when I saw her up on her stool washing her hands. She looked so old and it just hit me how fast time goes by. I always ask her if we can just move to neverland so she'll stay my little baby forever. She proceeds to roll her eyes and say duh mom I have to grow up so I can go to kindergarten. (Her lifes dream so far lol) Oh well till then when she leaves me for school I'll take her in and all the help that she brings. cutest picture ever. 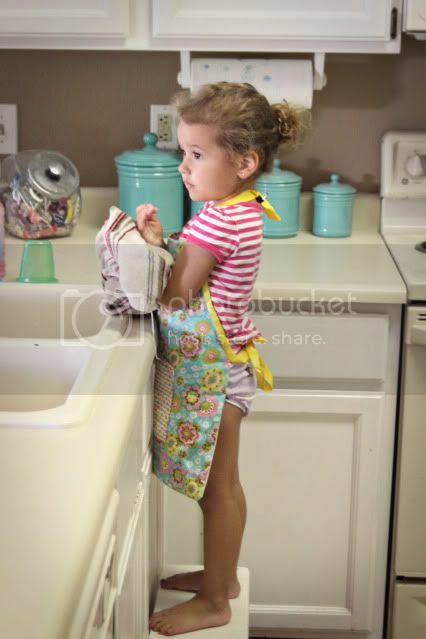 what a cute little housewive ;) sweet baby girl! too cute! I love that little girl! She cracks me up every week in primary.